On December 5th, 2008, an excellent episode of Moments that Changed Us aired on AmericanLife TV. 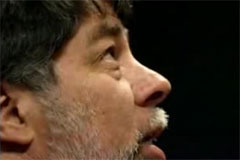 Produced and directed by Larry Herskowitz, this program documents the life of Steve Wozniak, co-founder of Apple Computer and inventor of the Apple 1 and II computers. Larry and his crew did a couple of days of shooting at the Digibarn in the summer of 2008. Digibarn co-founder and curator Bruce Damer was featured in this piece, and co-founder Al Lundell created the shots of the Apple II in action. This page has a video excerpt from the show. We would like to thank Larry Herskowitz and his excellent crew for making this happen and for allowing us to use these excerpts on the site. Also check out Digibarn Radio!